In many buildings, the fire sprinklers serving a commercial building might not be able to control or extinguish the fires that start without adequate amounts of water or water pressure. Here are some types of fire pumps you should work with your fire protection partner to evaluate and install. In many buildings, the fire sprinklers serving a commercial building might not be able to control or extinguish the fires that start without adequate amounts of water or water pressure. In these cases, it is necessary to get a fire pump. Here are some types of fire pumps you should work with your fire protection partner to evaluate and install. Horizontal Split Cases are the fire pumps you will see most often. Although it needs a water source that is not part of the system itself, it is still easy to work with. 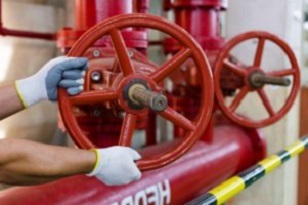 This means that many fire protection providers favor it above its counterparts. The components of the horizontal split case system are easy to reach and maintain. The size of the individual components varies as well, making it easier to replace them over time depending on what the system demands. Best of all, these systems last for years and are durable enough to provide reliable water delivery in all of that time. Vertical split case fire pumps are similar to their horizontal counterparts. The difference is that since they are vertical, they take up much less floor space. This can be a valuable distinction, especially in small businesses where there isn’t as much space for all of the necessary fire safety systems. One major benefit of this fire pump is that it protects the motor from flooding simply due to how it is built. Unlike the split-case fire pumps, the vertical in-line fire pump is smaller. These save space and are ideal for small businesses or other buildings that don’t have much room to go around. Although these units do not need a special base to anchor them, problems arise whenever it’s time for preventative maintenance. That’s because the entire fire pump system needs to be disassembled and removed. No matter which of the other systems are installed, all of them require positive suction to draw water from its source. This requirement does not apply to vertical turbine fire pumps. Instead, the vertical turbine fire pump can use water drawn from nearby wells or water tanks. Water is moved to the top and then dispensed whenever necessary. This entry was posted on Friday, November 16th, 2018 at 9:05 am. Both comments and pings are currently closed.